Sunday 3rd February – First Direct Arena. Put the date in your diary. Information for Leeds Gymnastics members will be available on the website soon. This years Annual Awards Evening will be held at New Dock Hall, at the Royal Armouries, Leeds on Saturday 17th March 2018. Arrival 6.15pm. Save the date now. Order forms will be available soon and at the gym. For those who attended last year they will know it was a fabulous event and a wonderful showcase of gymnastics. We have made some changes this year and are restricting the number of routines and removing the final march on for all gymnasts. This should considerably reduce the running time of the event. We are looking for new gymnasts to join our development programme. 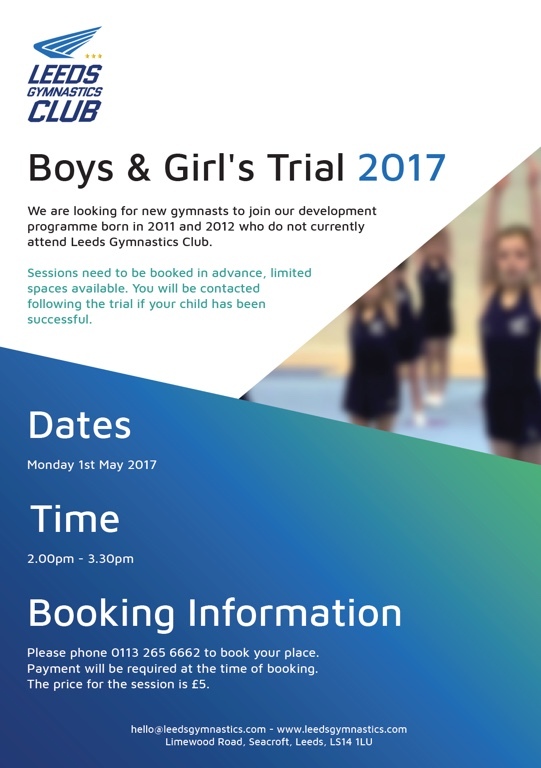 We are specifically trialling children born in 2011 and 2012, who do not currently attend Leeds Gymnastics Club. Children must be booked onto the trial in advance. Please be aware, spaces are limited. The price for the session is £5. Payment will be required at the time of booking. Email hello@leedsgymnastics.com for more info. A not to be missed opportunity to watch some amazing gymnasts including our very own Olympic Medallist Nile Wilson. Come along and enjoy a day of Gymnastics displays hosted by Leeds Gymnastics Club. We will be welcoming groups of gymnasts from all disciplines, of all ages and abilities from around the UK, who enjoy being part of the fun and excitement Gym Fest is all about. Adults £11, concessions £8 with a £1 transaction fee for print at home tickets or £2.50 for collection or postage of tickets. This years annual awards evening will be held at the Royal Armouries, Leeds on 4th February 2017. The theme of this years event, “RIO” follows on from the success of the Olympics . The evening is sure to be a colourful and fun filled extravaganza so be sure to get your order form and return it to the club by the 9th January 2017. Download the order form here or pick one up at the gym or ask your coach. We will be having a Christmas Fun Day for all our 1 and 1.5 hour gymnasts on Tuesday 20th December. We will be holding 3 separate fun sessions in which your children can show you what they have been learning in their weekly classes. For those keen parents, it will be a chance to let your child teach you some of their skills. The fun day sessions will be £5 per gymnast. We are hoping to raise £60,000 to replace both of our foam pits and your £5 will be used as part of our foam fundraising and enter you into a draw to win up to £200. You will be given a sticker to choose your foam block from the chart in the reception area. You must sign up to one of the sessions online (remembering to book each gymnast separately) so that we can estimate total numbers in each session. We do however have to put a maximum number of 60 children in each session for health and safety reasons. If sessions become full very quickly we will try to put on an extra session to give everyone the opportunity to take part. We are not affiliated, associated, authorised, endorsed by, or in any way officially connected with City of Leeds Trampoline & Tumbling Club or Leeds Rebound Gymnastics Club ( in association with City of Leeds Trampoline & Tumbling Club).